Abstract : This paper presents a fast and flexible curve/surface reconstruction technique based on implicit b-spline. This representation does not require any parameterization and it is locally supported. This fact has been exploited in this paper to propose a reconstruction technique through solving a sparse system of equations. This method is further accelerated to reduce the dimension to the active control lattice. Moreover, the surface smoothness and user interaction are allowed for controlling the surface. Finally, a novel weighting technique has been introduced in order to blend small patches and smooth them in the overlapping regions. The whole framework is very fast and efficient and can handle large cloud of points with low computational cost. 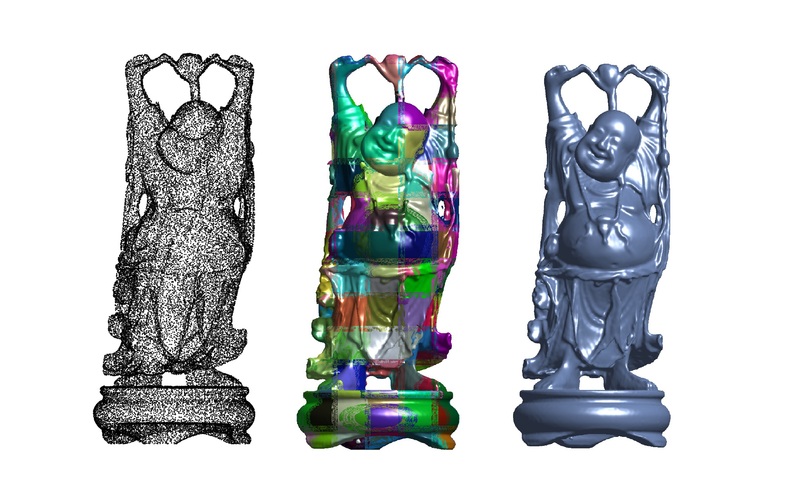 The experimental results show the flexibility and accuracy of the proposed algorithm to describe objects with complex topologies. Comparisons with other fitting methods highlight the superiority of the proposed approach in the presence of noise and missing data.